Along with the fast development in high way and rail way construction, Jaw crusher plays important role in the fields of railway, highway and other infrastructure construction. Increasing demands for aggregate and sand directly pushes forward jaw crusher growth in domestic and foreign machinery market. 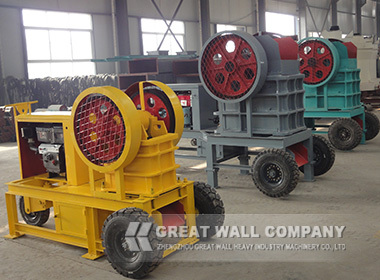 On basis of historical and professional stone crusher manufacturing experience, Great Wall Company stone crusher engineers invent and produce the PE jaw crusher, JC Europe type jaw crusher and PEC diesel engine jaw crusher. Jaw crusher crushing capacity and efficiency has close relationship with jaw crusher wear parts, high manganese jaw plate and side plate guarantee jaw crusher durable service life span. Our portable diesel small jaw crusher and diesel hammer crusher are specially designed for African countries, where they do not have sufficient electric power. Jaw crusher is mainly used as primary stone crushing equipment in crushing plant, if you are interested in jaw crusher price, please contact with us freely. Previous: How to improve jaw crusher service lifein crushing plant?